While I really was excited that Metallica was coming to Minneapolis I was certainly less impressed with the process to obtain reasonably priced tickets. No luck on the day before premature ticket discharge nor the actual day of sale. Ticketmaster’s site is just that bad but realistically probably spammed by bots sucking up the tickets at face value. 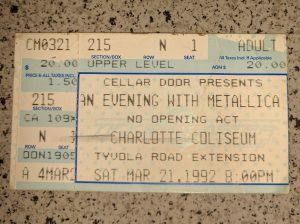 Anyway, I’m over it and feel fortunate enough to have seen Metallica in their mid career. I had thought about obtaining tickets from these other sites but the stubbornness in me refuses to support those sites in the hope that they get stuck with excess tickets and eventually something changes. It’s not the price at this point, just the principle. Fans are missing out on one of the better shows, it’s just sad… Perhaps Metallica can use their status in the industry to fight back against the bot behavior?, doubtful as they are making bank regardless and seem to fill seats consistently. Side note: it was awesome of them to allow the live stream on Pandora.